Not long ago, Google released Android Oreo, also known as Android O or Android 8, which smartphone manufacturers have since integrated into some of their latest products. It's no longer news that Android has become a household name in the mobile operating system sector as most smartphones ship one version or another. Changes in hardware technology, the dynamism of users' demand and expectation, and competitiveness have birthed the development of several Android versions to this time. Now Android Oreo 8.1, Go Edition comes as the latest of these series of versions. What does Google intend to achieve with this new release? Or are there features that offer better performances and respond to the mild hitches discovered while using other versions? The answer to these questions is not far-fetched. As you would have thought of it, something inspired this recent development which comes in within a short time frame after Android Oreo was released by the tech giants. To make sure billions more people can get access to computing, it’s important that entry-level devices are fully functioning smartphones that can browse the web and use apps. Implying from this, Android 8.1 is developed to, expand the scope of usage by providing compatibility with several other devices and improve performance. Subscribe to receive regular updates delivered to your mailbox as soon as posts are published on this blog. Growing businesses has never been an easy task, whether small or large settings. From customer satisfaction, optimisation, digital marketing to returns on investment, it requires commitment, technicality, skills, passion, and foresight. Luckily, blogs have simplified major aspects of handling business growth such as reaching new and sustaining existing customers. Top business organisations employ experts to control this area of their investment. While solutions such as blogging have contributed greatly to the plans of business growth, a major concern remains. You must be a skill IT and internet person to make a name with this solution. Mastery of areas such as Search Engine Optimisation, content development, graphics, email marketing, and social media marketing is needed to register your presence and command followership. This can take years of research, investment, advertisement, and personal development. Alternatively, WhatsApp, a sub-domain of the social media can aid you to alleviate the need for attaining all these qualifications - no blogging knowledge is required. You will have however possess good communication and customer relations skills to keep things going. Though many social media marketing solutions abound, WhatsApp can come in handy, especially for small business. A seemingly light-weight social app with cutting-edge features for advertising your business - from blog posts and directly if you don't own a blog. This approach is cost-effective and yields higher returns if you set things right. What, majorly, determines the approach on how to achieve this is your business goals! The ideas in this post are not exhaustive but clearly, present a cost-effective and efficient way of growing your business using the mammoth population WhatsApp has built. Whether you are a fashion designer, beans cake vendor, caterer, graphics designer, hair stylist, or shoe producer, you can apply these ideas to boost your enterprise and earn more income. Using WhatsApp for managing your business presents several advantages that can be leveraged to meet your business goals, both in the long run and on the short run. Those who have discovered and taken advantage of this keep promoting their worlds with it. First, it is a free social media application. Creating an account and adding contacts does not require any form of payment or premium services. With this, you can download and install the app on your smartphone or PC to get it running. Since its use relies on cellular data, direct financial costs are eradicated. Once you have a WhatsApp compliant device, you are good to go. Another advantage is in the ease with which you communicate with customers and business partners. With over a billion subscribers, WhatsApp presents business owners with the opportunity to reach several customers and build lasting patronage. 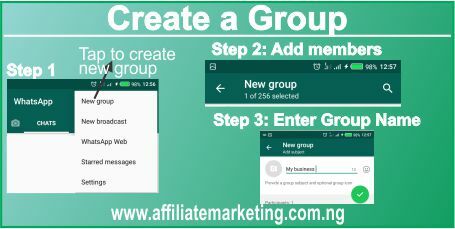 With a business group, updates on products, offers, coupons, discounts, training, seminars, and other services can easily be made known by sharing links or the content on a group that has been created. No needs to inform you how flexible it is for people to use WhatsApp. This is because it integrates a user-friendly interface that is complex and whose features can easily access without straining brain cells. Unlike most social applications, you can access the message interface once you open the application. The quick leap of WhatsApp in the social media table can be attributed to the wide support it presents to different platforms. By platforms, I am referring to the devices (smartphones, tablets, PCs) and operating systems on the app run. For instance, all devices working on Android OS are largely supported. With this OS constituting the larger percentage of portable devices across the globe, you are certain that many of them will be using this application as the main social media channel. Now, nobody wants to purchase a phone that has no support for it. On the contrary, sending the files through WhatsApp guarantees a higher percentage of access. They can download the files and access the files on the move. Response(s) can even be given faster and conveniently. With WhatsApp, you can share files such as Word (.doc, .docx), Spreadsheet (.xlsx), PDF, text files (.txt, .rtf), presentation (.ppt), and execution files (.exe). There is currently support for Zip files yet, though I have no doubt there will soon be. To apply the ideas in this post, you must put in place some things. The necessity for some is very high, while others can be introduced later. So, take a careful look at what you will need to use WhatsApp in promoting your business. This is a must! You can't use the app if your device does not support it. Your mobile phone, tablet, iPad, PC, must have full support before proceeding, otherwise, you will have to rely on someone else's device to manage your customers. Which Smartphone is supported by WhatsApp? One thing you must never forget is that customers react to how business owners relate to them that is why you must grow yourself to successfully relate to all kinds of customers on your platform. Customers, will definitely, present themselves in different ways - friendly, simple, hostile, aggressively, learned, unlearned, etc. Your aim is not their manner of approach, but to make them lasting followers. This demands great skills that revolve around the kind of language you use, the contents of your adverts, solutions you proffer to their problems, timeliness, and feedback. Just like you know, your customers will prefer businesses that attend to their needs as fast as possible. Thus, customer relations is critical to your business goals and plans and must not be taken with levity. This is not a much-needed skill but an additional requirement to increase patronage. It is one thing to have good contents for your customers and another to be aesthetically wonderful. Graphics can, in a short means, drive more meaning and intents than long words. When quality content meets purposeful design, the experience is always awesome. Graphics can come in the form of flyers, banners, posters, etc. Note that for members to view whatever graphics you upload, they must download. That is down to the network strength they are using and the size of the graphics. As much as possible, try to upload graphics with good resolution, but of small size. High resolution graphics are clear and sharp to the eyes than small resolution graphics. They are equally useful when users intend to zoom the graphics to read more details or view smaller letterings. With high resolution, the beauty will remain intact, while low resolution will result to distorted presentation. Also, the size of the graphics is very important. Small graphics sizes can be transmitted over the internet convenient without excessive network challenges. Unlike large graphics file sizes, you can upload and download them quicker and easily, since much data is not consumed. JPEG images are the most useful for this because they're compressed to a reasonable size. However, for sharper and transparent-background images, use PNG formats. Though this is not necessarily a core requirement, a knowledge of it will add more to your business' optimisation. Whether it is a video or a GIF format, people are always attracted by action, dynamism, and uniqueness. With such skills, you can often create tailored videos to market your products, give insight, or just keep your customers excited. If you have no multimedia skills but intend to use videos and animations, reach out to those who can and discuss your terms with them. Though this presents design concerns as some multimedia designers might not understand what your goal is, you can always go through the contents and the idea behind its creation, before publishing your video or animation. One thing to note is that people hate long videos and animations. Therefore, consider the duration of the video and animation you are creating. It is not the length that matters, but the quality of what you present. In designing your videos and animations, use aesthetic designs and never forget to grab attention with action-based contents. Whether you create or engage someone else to create the videos or animations for you, ensure that you keep your customers excited by creating what solves their problems, addresses their fears, or meets their demands. I have spoken so much on the basics and I'm sure you're eager to grab these ideas of growing your business or blog with WhatsApp. These are five proven ways you can grow your snall scale busines to a profitable one and increase you ROI to over 100%. Your business growth begins from the moment you build a recognisable customer-base with high ROI which is achieved by providing tailored services to each customer as needed. This is very important and should be hugely invested upon. Without subscribers (some of which will become buyers) you can make your business plans and grow geometrically. So, you have to develop subscribers using your platform. Since this post is based on the use of WhatsApp, I will discuss the ways of using it effectively to achieving your business goals. This is where the journey begins. First things first ..... create a WhatsApp Group! This is just like the usual newsletter subscriber of a blog. In addition, you can manage all your customers from this group without incurring high costs. Launch WhatsApp on your smartphone or PC to reveal the default notification page. At the right top corner, tap the menu icon. This is usually three dots arranged vertically. Tap New group and select those you want to add to the group as members. Remember that you don't just want tot add anyone but those who are interested. So, only add some of your already existing customers and contact to tell them you want to add them to your business group. Everyone has the right to privacy! If you doubtful of those to add, don't worry. Add just a contact. It can be your second account or that of a close friends. Group members will later troop in willingly when you publish the link with a vivid insight on what the group aims to achieve. After selecting group members, tap the green arrow at the bottom to continue. Enter the name of the group and a logo, if there is any. You can name the group after your business, but avoid long names and those that are difficult to pronounce. Keep it short and clear. To continue, tap the green button. Wait for a while as WhatsApp creates the group for you. Now you have created a group, and sure, you need more group members. Your next task will be to add willing members to your group and enlarge your audience. How do you achieve that? Quite simple?! Reach out to potential customers. This you can do by publishing the groups link and talking to others about your business and the group you've createtd. Launch WhatsApp and open your bausiness group by tapping on it. From there, tap the menu at the top right corner (as usual, the menu is symbolised by three dots arranged vertically). Click on Group info to reveal the members of the group and other information. At the top right corner, tap the add user symbol. This will open a page containing all your contacts and a means for inviting via group link. Tap Invite to group via link. Now copy the link displayed by tapping Copy link or simply write it down if that's convenient. Now, your group's link is ready for publishing. But, make it neater. Use a link shortener to reduce the length of the link and make it finer. You can do that with tinyurl. You can publish this shortned link on several platforms. Anyone that clicks or follows the link will automatically become a member of the group. This reduces the manual input require to add new members to the link. To think of, those on your contacts might be interested in becoming members if you provide hints on the group's goal. So, your first point of call will be to publish the link to your contacts using SMS, be bulk or usual messaging system. In few words describe what the group is and why it is necessary for them to become members. Then, provide the link for them tap and join the group willingly. Depending on rhe number of contacts, little cost will apply. In situations where the numbers are too much, switch to bulk SMS. You can search for available bulk SMS providers in your locality. This is cheaper compared to using cellular networks. This is another reliable way you can publish your link. It's most effective if you have been communicating with some of your customers via email. Now, compose a compelling email that describes the group you've created and what you seek to achieve with it. Never forget to state how it will benefit them. Add the link at the end informing them to click and join, if interested. If you own a blog, website or write on other blogs, use that as opportunity to invite people to join the group. Since you focus will be to increase the ROI, let only interested people join the group. This you can do by explaining the group's goals and objectives which will cover the brand of your products, niche and nature of services. Once individuals are able to get a vivid understanding of what theh group is all about, they can decide to join or not join. It's better that way if you expect to earn from this membership and patronage. Social media has been awesome in reaching prospective buyers and subscribers. Publish updates with the link included to link people. Platforms such as Facebook, Google+, Twitter, Instagram, etc. will be useful in expanding your reach. Even if you a sizeable number of customers at your disposal, marketing is core at achieving your business goals. By marketing, I mean making your products accessible to customers and generating the effective demand (their willingness to pay for your products) in them. Just as developing subscribers and customers are important to your business, so is marketing. It requires dynamism, creativity, ability to sense the needs of customers and respond to it, and test running several solutions. But, you must first be prepared for it. Marketing encompasses all the efforts made to make your business noticed by prospective customers and selling your products to them. Be it an outreach, discussion, emailing, newsletter, advert placement, or business seminar, the goal is to sell your products and services. That is marketing. 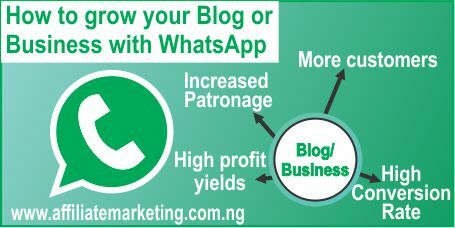 So, how do you market your business or blog on WhatsApp? Do you think it pays to consider using such methods? 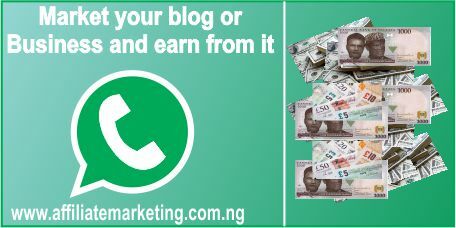 Well, I can assure that many entrepreneurs make a whole lot income by advertising their business on WhatsApp groups. Information is vital to your business on both sides - customers or business owner. keep your customers abreast of latest products, changes, ideas, techniques and ways of making the best out of the products they purchase from you by dropping a post. If you own a blog and have published a post that is related to your business, then simply share it in the group for members to read by following the link. Either way, ensure that the posts you publish or share on the platform are relevant to the goals of both the group and your business. You have to keep the group lively. Nobody wants to be part of a boring social media group. Think of engaging ways to keep members contributing to discussions. Discussions can be initiated in the form of questions or problems that some of your customers have raised with you privately or your business challenges. During discussions, don't claim to be the boss, else you will shut down ideas that would have been useful to your business. Just keep calm and allow group members to tender their opinions and ideas. your concern is to use the 'third-eye' in unearthing relevant information for improving your business or creating solutions to the problems your customers are facing. This can be done every day or thrice a week to get them engaged and wishing to access the group each time they launch their applications. Seminars? yes, you need to conduct e-seminars! Wait ... I don't know what to present, how do I go about it? Well, that's quite simple too! Seminars are innovative ways of engaging your customers further and displaying the mastery of your business niche. The topics you anchor will provide insights that will bond your customers to the business on the long run. One mistake you must avoid is anchoring a topic that is not relevant or related to the nature of business your run. research relevant topics, read wide on them and relate them to your business before anchoring any. At some points, as your business grows, you might to ocassionally invite guest speakers or renowned achievement in your business area to anchor the seminars. This will show how you have establish resourceful relationship with successful individuals. 1. Plan for the days - weekly, monthly, bi-monthly, quarterly, annually, the choice is yours. 2. Notify members of the date and agenda for the seminar. you can use flyers, banners, and posters to do so. Status updates can equally be used. Don't just do it once, but repeatedly till the D-day. 3. Give room for feedback - questions, comments, requests, complaints, etc. This will help a lot. 4. State the rules before the seminar begin. One of such rule is, "respect others' opinions". I wasn't going to leave out this. How will you sell if you don't advertise what you have? Whether your products are physical, intellectual or virtual, advertise them and provide means for them to place orders or make requests. Write short periodic contents to inform group members of your product and services, especially after a new person joins the group. For default contents, mark as the favourite so that you can always find it easy to access and reuse when necessary. Create quality graphics with rich contents and beauty to display the products. This is effective when you offer physical products. Capture the products as pictures and then create a beautiful design with any good graphics software. You might not have the privilege of using a computer, simply download a post maker or graphics app from a mobile store and customise your designs to your taste. I don't need to emphasis on how multimedia contents like videos and animations can create stronger bonds between you and your customers, especailly if the contents provide solutions to the problems they encounter while using your products and services or other related products. Just make sure the file size is not large and can be easily downloaded or viewed by group members. Additionally, arrange contents dynamically to attract more leads and increase conversion rate. As good as multimedia contents may be, misuse can trun on the ugly side of marketing resulting to losing more customers and decrease in conversion rate. That's why you must assess and understudy your cutsomers very well to understand their needs, what drives them, what puts them off, and how best you can satisfy them. The information you gather from these analyses will be useful in creating befitting videos and animations. How I am to do such analysis? Simple! Gather data from group discussions, seminars, private chats with customers, and verbal feedbacks. Then categorise them to reveal the trivial concerns of your customers and begin from there. Building informed solutions using this process offers the highest return rate than just displaying unresearched skills. From the beginning, the target of having a Business WhatsApp Group is to increase the profit you make from your business. Depending on the popularity and the number of group members you have, other businesses, and or companies might want to do business with you by placing adverts and publishing posts that link members to their products. Be wise enough to present judicious prices that will make them come again. You might have to assess the nature of advert and post they want to publish before agreeing to the terms. To keep them coming, convince your customers of the quality of services they should be expecting from the advertisers. You must conduct intensive research of the advertiser before convincing members of their products, else, it will bounce back on your business. Then again, you must be careful not to divert customers away as that can reduce the returns you make on your part. Avoid granting advertisement rights to related businesses as this will affect your customer base. Manage these adverts to ensure that advertisers stick to agreements and content policies/guidelines. Also, develop a duration monitoring sytem to track the expiration of adverts placed on the platform. With this, you'll not be cheated or loss track of the expiration of adverts placed on the group. To ensure steady growth and avoid customer attrition, you need to maintain the flow of things in the group. This is where management comes in. For a small group, it will definitely not be an issue. You can easily control activities, respond to request, and answer questions timely. However, as followership increases, different needs will arise requiring improved managerial skills. Let say you're WhatsApp group now has 1 million subscribers of which you have been able to convert 75%, then your workload has increase. Effective and efficient management is definitely needed to increase conversions and reduce attrition. Managing the group encompasses, the brand identity (especially with logos), business designs, number of admins, customer care services, status updates, among other things. You will need more hands to take care of this. Let look at some managerial responsibilities and how to handle them for larger groups. Doing business the righth way now or owning a blog requires that you have a logo with which others can reckon with your brand. Logos speak alot where words cannot. So, think of a simple, unique and aesthetically appealing design for your logo. If you already have one that softens the minds of customers, thn ride on. Use the logo as the group's profile picture or image, so people can easily see the name and other vital details it contains. Equally include it in most of your graphics designs and multimedia contents for adverts and updates. It's not a must you be the author of post or vet posts that are published on the group. You can have an editor, and other publishers who understand your business goals to publish and vet posts (for the posts coming from customers). This will give you room to attend to other customers and business needs. This implies that posts will not be published directly on the page. Posts must be submitted privately to designated persons who will vet before deciding whether they are good enough to published on the platform. This will address unauthorised advert placement and out-of-place posts by customers. As I earlier stated, when the membership of the group increases, your workload will definitely be high. To effectively manage this increase, you'll need other group admins with clearcut responsibilities to avoid clash of interest. Admins will have equal rights like you. They can remove contacts, delete notifications and updates, and add group members. When admins are properly allocated, managing a large member-group will not be a problem as each admin is clear on what to do and how to do it. Your business must have a standard complaint system that responds to customers' concerns in a timely manner. This is a crucial aspect you must not ignore or take lightly. When customers complain or make rerquests without receiving prompt and satisfactory response, their patronage diminishes and that isn't healthy for what you do. So, develop a good customer care funnel to maintain patronage and inject confidence in your customers. You can assign group admins to handle this aspect of your business, and try to separate their roles as time would be concerned. Well, to properly run this, you will need to work by principles and guidelines. These will control how activities and conversations are done on the platform. The list below is not exhaustive, you cann add yours that will make everything work just fine. 1. Make all members know the dos and don'ts of the group from onset to avoid things from getting out of hand. 2. Communication among members must be mutual and void of discrimination. 3. For seminars, start time should be strictly adhered to. This will reveal the level to which you can be trusted by customers. 4. All members/customers should be treated with respect without direct division. Whether a particular member is bringing in returns or not, keep providing the needed services and response. You never can tell how useful they might become later. 5. No question is a wrong question. Try to understand members' questions before providing answers. If it requires a private chat, do so. We are driven by several goals, but driven towards making profit from our different businesses. Social media can be a useful resource for increasing sales and WhatsApp happen to fit in rightly. Don't hesitate to start and manage a group today. It will seriously boost and increase the profit you make. Ensure to make it wisely and dynamically. Remember that you are not the only one in this. There are other people in the same business sector who want to rock high. They can capitalise on your mistakes to grow their businesses. Therefore, don't give room for critical mistakes.